Our pet fence systems consist of an Outdoor Transmitter with underground wire and either the UltraElite™ or UltraMax® receiver for a complete dog fence system that is safer by design for greater piece of mind. The newest product, the Universal Remote Trainer works with your system to help modify unwanted behaviors. Outdoor Transmitter – Creates signal sent through wire. Our Outdoor Transmitter creates a customized pet containment system for your dog or cat! The Outdoor Transmitter with wire out of sight creates a customized dog fence or cat fence designed with diverse zones and settings – keeping your pet secure while maintaining the beauty of your property. It has an easy to read digital display, power loss memory, wire break warning, and built in lightning protection with warning tone. It is temperature safe; designed to ensure the signal field will not change regardless of the temperature outside. 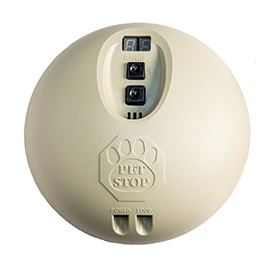 Unlike other dog fence systems that use an AM or FM frequency, Pet Stop transmitters features FCC-approved Digital Modulation-or DM-technology. This more advanced method has been proven as the most effective way to guard against false activation and interference from other signals, DM ensures a clear digital code that delivers the precise signal intended, leaving no “holes” in your pet fence. It also allows for a wider array of multiple frequencies, which is an effective way to avoid interference if your neighbor has a similar system – or installs a Pet Stop pet fence system after seeing how well it works for you and your pet! Not just for outdoor containment, our technology can easily keep your cat or dog off the kitchen countertop, or your dog out of the litter box. An indoor pet fence system is so accurate that it can have zones as small as only a few feet, but can also keep your pet out of the living room, dining room, away from the front door, or out of the second floor of your home. Our UltraElite™ Series 2 Receiver is the smallest receiver on the market at just 1.2 ounces! Omni-directional antenna – no blind spots to stop the receiver from working. Soft Rubber contact probes – more comfortable for your pet. Battery saving technology – the receiver has sleep mode, saving battery life. 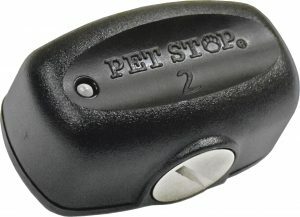 Progressive levels – receiver can change setting to customize for your pet. Concise digital signal – Prevent false activation from stray signals coming from household appliances or cables. No other product in the industry has these unique combination of features. The UltraElite can be programmed to work on most Pet fence transmitters including: PetSafe®, Pet Guardian®, Dog Watch®, and Dog Guard®. Our UltraMax® unit is designed especially for the stubborn or more determined dog! Utilizing a highly efficient circuit, the UltraMax features a host of settings, including an adjustable correction that is the most effective in the business in keeping your pets safe and secure. Our Universal Remote Trainer can quickly and easily help you solve frustrating behaviors in your dog! With the push of a button you’ll be rewarding your dog’s good behaviors with a calming vibration or discourage bad ones (jumping up, stealing food, excessive barking or chewing) using the brief attention getting pulse. Micro Pulse – Half second duration pulse option sends a static correction that lasts as long as you can blink your eyes. Just enough of a tap to tell your dog what they are doing is off limits and to stop the behavior. Warning Tone – A quick tone (beep) will signal any pet fence trained dog to think about what they are doing at that moment, and redirect their focus to you! NEW! Range Alert – The hand controller has both audio and visual cues to notify you should your dog move out of range and your handheld remote cannot communicate with the collar. Two Dog Control – Even with a tandem of dogs, this one of a kind feature will allow you to correct one dog’s behavior, while the other is behaving. For a FREE in home estimate Call Todd Holden at (814) 360-7350 today.